BRIGHTON, Mich. - The Ford F-150 has officially topped the Toyota Camry as the most American Vehicle in the Cars.com annual "American Made Index". This award comes shortly after the Ford F-150 dominated the 2013 Light-Duty Pickup Challenge, as well as its continued success as being the best-selling truck for 37 years. With so many accomplishments under it's bumper, the Ford F-150 is taking the country by storm. The Ford F-150 topped the Toyota as the most American vehicle for a number of reasons. The American Made Index, created by Cars.com, used various factors to determine the 'American-ness' of each vehicle. Specifically, they determined where the car and its parts were built, and then how many of them were sold. Over 75% of the F-150 is manufactured in the United States; the two F-150 factories produce in Dearborn, Michigan and Claycomo, Missouri. 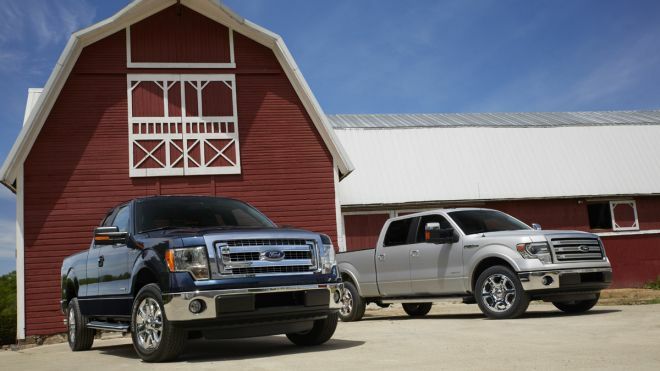 As for the number of vehicles sold, the Ford F-150 has done exceptionally well this year. Ford Motor Company will even be adding 2,000 workers at the F-150 factory in Missouri to continue to produce to meet the demand. Interested in getting your very own American Ford F-150? Make sure to check out our 2013 Ford F-150 Brochure and stop in at our South Lyon Area Ford Dealer to take it for a test drive! Our exceptional staff is happy to assist you with any questions or concerns you may have, and can help you with everything from Used Car Value to Used Car Loans. Brighton Ford is located at 8240 Grand River Ave. just north of I-96 in Brighton. We are a family owned and operated business that is committed to customer satisfaction. For more information on Brighton Ford visitBrightonFord.com or give us a call at (800) 836-8206.